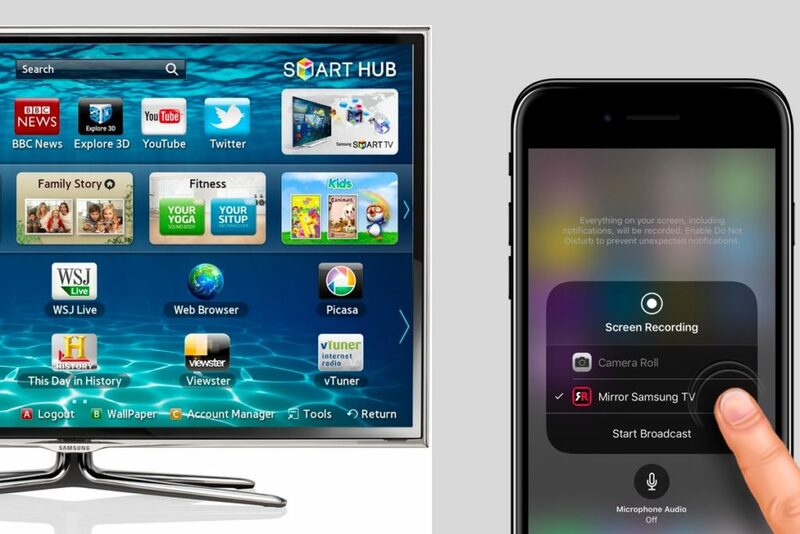 Good news for Samsung Smart TV owners: AirBeam TV has developed an iOS app ($4.99) that lets you mirror your mobile device to a Samsung Smart TV, no Apple TV required. Update: The solution will also work with televisions from LG, and various streaming devices — you can even use this to beam video from an iPhone or iPad to one of those cheap Amazon Fire TV sticks. “Since our launch of the Mirror for Samsung TV app for macOS back in May 2016, we had numerous requests from customers who wanted to have the same functionality on their iPhones and iPads”, says Jan van Ottele, co-founder and CEO of the company. The Dutch company says the solution is based on Apple’s recently extended ReplayKit framework. “At WWDC 2017, Apple announced that they have extended the functionality of the ReplayKit framework”, explains Demid Borodin, co-founder and Director of Video Technology. What it does is very much like streaming video content using an Apple TV and AirPlay, except no additional lit is required. You can also mirror any app on your device to your Samsung TV with this solution. To start screen mirroring, customers need to download the Mirror for Samsung TV app from the App Store. Before using the app, Screen Recording should be enabled in Control Centre. Once this is enabled, users can discover and select their Samsung TV, so long as it is on the same network. You can then start mirroring to that television with just a long press on Screen Recording button in Control Center. More details in this video tutorial. If you encounter any problems setting the system up, please refer to the extensive FAQ on the company website. The app only works with iPhone 6s and later, iPad Pro and recent (fifth generation) iPads. It also requires a 2012 or later Samsung Smart TV. (You can sometimes pick up some older but still supported models of these for less than the price of an Apple TV). Given that Samsung Smart TV’s are quite widely deployed, I think this little app may turn out to be rather popular. At least it makes it easy to watch Amazon Prime shows using your television and iPhone — though the company also makes apps that let you beam content from your iOS device to an Amazon Fire product, Chromecast, Roku and more (see. video below). Updates: Various updates across this report April 30, 2018. Great compilation! I’d add ArkMS app for Mac, which allows to stream all kinds of media from your Mac to different devices (TV, Xbox, iphone, etc). I have been using it and it works great, without any bugs, plus very user friendly. The biggest feature is that I don’t need to use all these expensive adapters and cables.